We can call this a concert, a performance, gig… It is one of the highlights for all students, a goal we are always working towards. This is a chance for all to shine. No matter how simple or complex your instrument part is, you have a part in the show! Does it get any more exciting than playing in a band on stage, loud music, a crowd cheering? 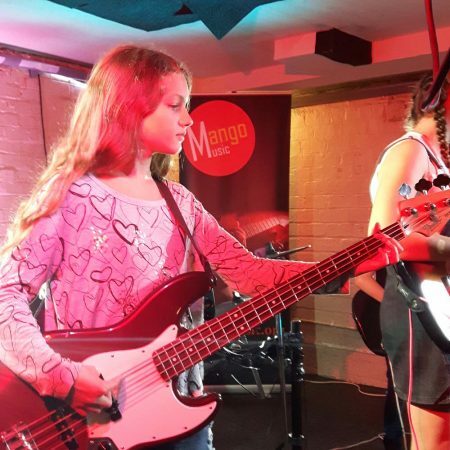 Imagine your friends and family there to support you, the Mango Music community of players and pupils, parents and pals. Everyone loves it! Students are helped through the show and prompted where needed. It is a wonderful learning experience – taming your nerves, developing your stage presence and improving your personal presentation. Performance pieces are all practised throughout the band workshops, containing are a mixture of songs from the curriculum and from popular music.